The Strategy reflects current development stage of the Academy, development priority in medium-term and long-term perspectives. enlarged meeting of the Academy with the participation of structural subdivisions and subordinate centers of MES of RK (13June, 2013). Implementation of the Strategy will enable to effective functioning of the Academy, raise its status, positive image that will enable to play a key role in updating the content of Kazakhstani education. Scientific-pedagogical, methodological and teaching- methodological support of national education system development taking into consideration best national and international practices, practice of Nazarbayev Intellectual Schools, Nazarbayev University and “Қәсіпкер”holding company basedon the principles of transparency, openness and corporatism. National academy of education named after Y.Altynsarin is a republican scientific - educational center that consolidates the efforts of all interested parties (stakeholders) to promote modern education paradigm based on the expansion of academic freedom and social responsibility. Academy of Education has 80-year history. In 1933 Pedagogical Research Institute was created, in 1951 it was transformed into the Scientific Research Institute of Pedagogical Sciences. In 1993, Institute of education issues named after Y.Altynsarin was created on the base of the Scientific Research Institute, that since 1998 was renamed the Kazakh Academy of Education named after Y.Altynsarin. Republican State Enterprise "National Academy of Education named after Y.Altynsarin» of Ministry of Education and Science of the Republic of Kazakhstan was created upon the resolution of the Government of the Republic of Kazakhstan dated April 18, 2008 № 365. During its activity, the Academy became a base of methodological guidelines definition and the creation of teaching materials used directly in the educational process. The Academy as an outpost of pedagogy helped to strengthen the role of education as a factor in securing the country's competitiveness. Since 2000, different republican centers with original profile functions of the Academy have been established, among them: the National Center for State Education Standards and Testing (since 2008 - National Test Center);Republican scientific and practical center of 12-year education issues (in 2008 was attached to the Academy); Republican scientific and practical center "Uchebnik", National Center for Education Statistics and Assessment; Republican Training Center for supplementary education; Republican Center "Preschool childhood"; Republican scientific and methodical center of technical and vocational education development and awarding qualifications; Bologna Process and Academic Mobility Center,etc. Creation of such countervailing and often duplicative structures has led to the weakening of the role of the Academy as a center accumulating, transforming and transmitting the main achievements of educational thought and best practices of their implementation in the educational process at all levels of educational institutions. - low salary of the researchers’ inflexible management system of the Academy related to its legal form. - development of inner reserves of increasing the efficiency of management and staffing. - average age of the researchers – 47 years. Creation and successful operation of the national research center providing updated traditional education practice through the transformation of pedagogical paradigm and the impact on the educational policy of the state. - development of the Academy human resources. 1. Theoretical and methodological support of philosophy and education policy. 2. Scientific and methodological support of integration and continuity of all levels of education. 3. Teaching-methodological support of update process of education practice. 4. Information and analytical support of the theory and practice of education. Activity 1: Theoretical and methodological support of philosophy and education policy. - opening of the Dissertation Council for awarding the degree of Doctor of Philosophy (PhD) on all pedagogical sciences. Activity 2.Scientific and methodological support of integration and continuity of all levels of education. discussion of conceptual provisions of modern school and professional education at the national and international levels through conducting scientific-practical conferences, symposia and seminars. Activity 3. Teaching-methodological support of update process of education practice. 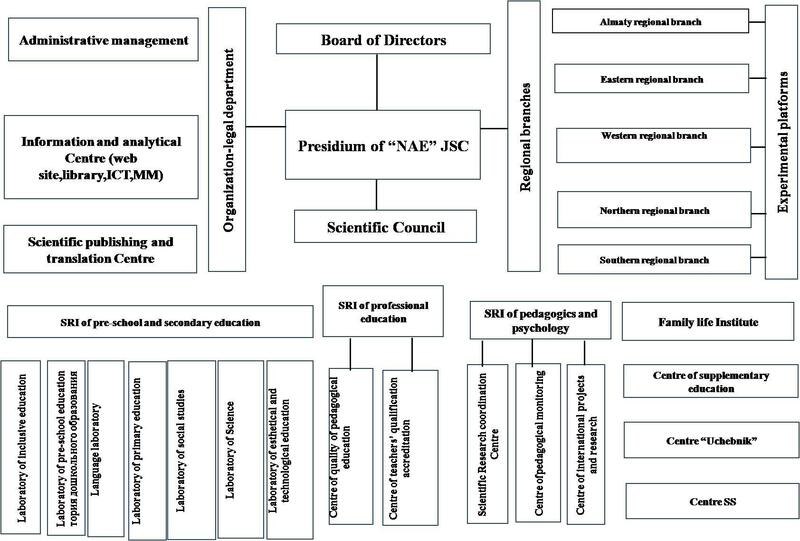 creation of Scientific Coordination Council on updated content of education under the Academy. Activity 4: Information and analytical support of the theory and practice of education. - carry out extended meetings of the Scientific Council of the Academy with the participation of subordinate organizations for the rapid exchange of information and solution of common problems. - creation of Publishing in the Academy by expanding functions of the publishing center. Activity 1:Theoretical and methodological support of philosophy and education policy. Activity1:Theoretical and methodological support of philosophy and education policy. Activity 2:Scientific and methodological support of integration and continuity of all levels of education. Activity3:Teaching-methodological support of update process of education practice. Activity3: Teaching-methodological support of update process of education practice. Activity 4:Information and analytical support of the theory and practice of education.